On the eve of the celebration of first 500 members of The Test Tribe Facebook group, an involuntary initiative took the shape of a varied and formed a rich list of crowdsourced software testing tips. 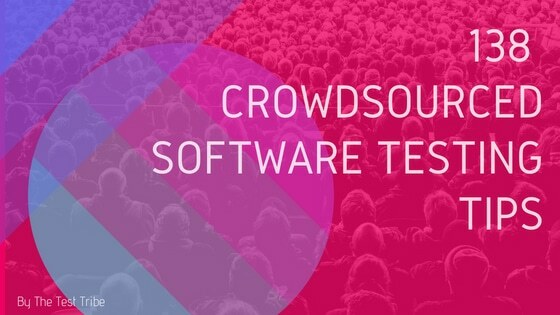 Software Testers from various backgrounds, domain and technologies poured their bit which was later cherry-picked and curated to form a list of 138 crowdsourced software testing tips. The tips are listed along with their author with a view that it surely will help fellow Software Testers in some form or the other. Big Thank You to all the Contributors. So here we go. Don’t pay a lot of attention to numbers alone. They don’t tell you the complete story. Accompany numbers with stories that matter. Try to replicate the Customers Issues. So that we can get more knowledge on the product. if possible take previous customer tickets, and try to analyze it. Do not hesitate to ask questions of anyone and at the same time do not show ego in answering to any of the questions from anyone. Mobile Testing- Download Crash File( Android) and plist file (iOS) and analyze the reasons and root causes for the Crash. While reporting application crash bug/ game crash bug, do attach the crash log. Check the UI on different screen sizes. Designing for all the varying screen sizes — especially in the Android market is a big challenge. The app has to perform consistently with all of them. If the user sees a screen with elements that don’t align or worse, bleed off the page there’s a good chance they will uninstall the app immediately. For this reason, you need to map all the models the app will support and test the app in each screen size on each device. If two different models have the same screen size, it’s not necessary to test the UI in both devices. For example: If the app supports both the iPhone 5 and iPhone 5s, a test of only one of them should suffice. Test for the brute-force attack wherever possible. Check for host header injection. Just change the host: value and check whether it’s redirected to the host or not. Session ID Prediction- Many web applications manage authentication by using session identifiers (session IDs). Therefore, if session ID generation is predictable, a malicious user could be able to find a valid session ID and gain unauthorized access to the application, impersonating a previously authenticated user. Check for CSRF related issues. Verify that restricted page should not be accessible by the user after session timeout. Verify that Error Message does not contain malicious information so that hacker will use this information to hack website. Ask yourself if you are performing the important(as per your context) tests first. Consider discussing your tests/test strategy with fellow tester/developer in your team. Brainstorming brings awesome results. Ask your Dev about Root Cause of the defect he just fixed. Ask your Dev if there is any impacted area(to be regressed) for the defect he just fixed. Are you communicating constructively? Remember that it matters a lot in our Job. Practice the skill of Note Taking. It helps almost all the time to a Tester. Staying aware all the time is a skill. Practice that. Eg. You want to complete a flow from step 1 to step n. That’s your end goal, but you should still notice the spelling mistake in an overlay message which was there just for a second. Keep developer tools(console) open while you test and keep an eye on script(js) errors if any. You are able to add a record. Great. But how much time it took? Keep an eye on response time. Catching UI glitches? Great. But are your noticing UI inconsistencies as well? Name*: Age * : Not ok.
Browser Developer Tools: Get familiar with the Network tab. Helps a lot to see what requests are going and what response you are getting even when nothing is reflected on UI due to possible error. Browser Developer Tools: Try out Browser compatibility modes in IE. Not 100% same as the actual browser but comes very handy when you need to test on different versions of IE when you actually have just one. Do view page source(right click on the page or through developer toolbox) once in a while. See if any information revealed which ideally should not be revealed. Login. View doc. Copy URL. Logout. Hit the copied URL. You should be redirected to the login page again. Security: Have an open sign up page but no captcha/recaptcha implemented? Suggest having so asap to your product owner. Use the spell check plugin. One click and you get any/all spelling errors on the page. Consider testing your web app on different screen resolutions/sizes. Be aware of the environment in which the application is tested. A defect should be accompanied by the environment details and evidence. This makes the defect clear to understand and reduces to and fro of Developer and Tester. Ask people from another department to evaluate the product or feature the product under test. It will certainly bring unnoticed review comments. Never ever tell the identified bug orally to developers unless the project process states to do so. It’s better to be formal in communicating the defects via Email or logging it into the Defect tracking tool. Review plays an important role in Testing, let the seniors review your testing at least once. So that we get to know some missing cases if it’s available. In this way, we also learn the perspective of senior/other Tester on the given task. Always share the new things with teammates & introduce the better way of testing if we learn any good thing. If junior/senior or any teammate missed anything while testing then avoid doing or saying anything which may demotivate him/her. Just handle the things in a proper way. Do make him/her understand the impact of missing on the project. It will help him/her to improve their skills & make them responsible for their own work. Always respect the suggestions of every member of the team. And finally, decide on the things which are good for everyone. Don’t test anything in pressure even if the timelines are closed. Do ask regarding the timelines and take a proper time for testing and do it properly. Else end user will face problems and company repo affect due to that. Give go ahead of your project when you are satisfied. That improves the quality of the product & our testing skills. Try to do testing on real devices & if it’s not available then take help of simulator/emulators. Make sure you have a solid understanding of requirements before starting the test. No Business Requirement. No wiki article. Boils to No RTM. No effective testing. Ask Product Owners, Dev to ensure one is created. Tests cases are to improve the software efficiency, not to demoralize the developers. Be constructive while defect discussion and not defensive. Brainstorm the Test cases written. 100 minds lead to 100 different ideas. Communication is the key. Persuasive communication can take one tester far ahead than planned. Connect with other teams in the project as well. Such as Support Team, Dev Team, Delivery Team. This networking helps you get to keep yourself abreast about their process flow which can of use when fixing on timelines, deliverable dates etc. Provide all relevant information in the bug. As much as that dev shouldn’t be feeling the need to put the bug in need more info state. And hence save the overall turn around time. May it be browser details or a scrolling screenshot, or in case If steps are little complicated, attach a bug reproducing video. Make sure to document your results, not just keep it to yourself, but keep it always published in Confluence. And that way the next iterations of the report would be easily comparable with previous data accessible and available. Analyse the requirements and try to get in touch with the client with a view of understanding their expectation from the QA team. It happens that sometimes the client expects out of the box scenarios and extensive testing from the QA team. It is always recommended at least to get the scenarios reviewed by the client or project coordinator. Look at UI from a layman user perspective. Ultimately it won’t be that only engineers using the application rather people who may not be that used to technology using it. Note down the eta required for resolving any kind of blocker or critical. As time is also an important constraint. Peer review always adds value to your testing effort, don’t forget it! If anything changes in the requirements down the line, ensure that the changes are mapped on all levels of STLC as well. Disclaimer: Testing tips listed above are completely crowdsourced. Opinions expressed/vocab used are/is their own. The Test Tribe team has just made negligible formatting alterations in the original content. AMA session with Lalit Bhamare on “Changing Role of a Tester”.